At our 11:00 Praise Service, we offer a multi-age Sunday School classes for children in kindergarten through 5th grade. Our nursery is staffed for infants through preschool. For more nursery information, click here. Children whose families worship at the 11:00 a.m. praise service will be invited to join their parents in the Great Room at the beginning of worship. Children will be dismissed to Sunday School prior to the sermon. Our curriculum guide for this multi-age class is One Room Sunday School by Cokesbury. 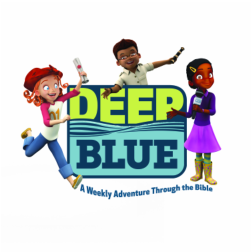 It is essentially the Deep Blue curriculum used in the 9:30 worship service but with activities geared towards a multi-age group.